Some are nearly as tall as ten story buildings. The rock formations resemble people, animals, plants, and whatever else your imagination may identify. They include reflecting lakes, caves and pagoda lookouts. Stone Forest is large. It covers over 300 square kilometers (120 square miles). Most of the popular tourist attractions are located in the north, near the entrance. How the Stone Forest originated: Some 200 million years ago an ancient seabed covered with limestone sediment rose to become land. Then, wind and rain slowly eroded the limestone, leaving behind the bizarre rock pillars we see today. To enjoy the Stone Forest at its serene best, go either early in the day or late in the afternoon. You'll avoid the crowded paths and loud talking guides. As a bonus, the lower angles of the sun make the rock pillars more striking to the eye and camera. The local Sani ethnic group has an interesting annual Torch Festival on the 24th day of the sixth lunar month (usually June). Young men run among the lantern lit rock formations to find and propose to their love interests. 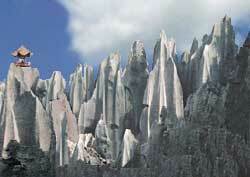 The Stone Forest is a two hour drive southeast from Kunming, the capital of Yunnan province.